The Derretta, 1994 base with some attitude. Re: The Derretta, 1994 base with some attitude. Thankyou sir! That FFP balancer is going on the shelf in my living room when I go back to a factory balancer this winter, lol. 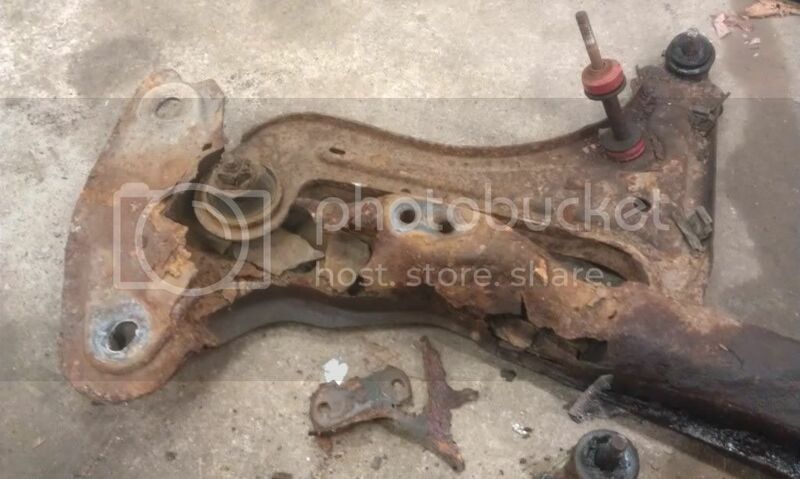 We were going to just change the OPSU due to a bad oil leak... needless to say this resulted in having to go to a local JY immediately to find a replacement subframe assy. Mother of God... How did he make it there?! And thanks man! I do love those new fillers too! I need to post a pic of those, one of the many things I forgot! Last edited by whiteretta on Tue Dec 09, 2014 7:57 pm, edited 1 time in total. Nice, I can't wait to get the black GT home! Which tails did you get??? Crap! I meant fillers, haha. These fillers! I'm a little more sad I can't find the photos of my old control arms, they were trashed! 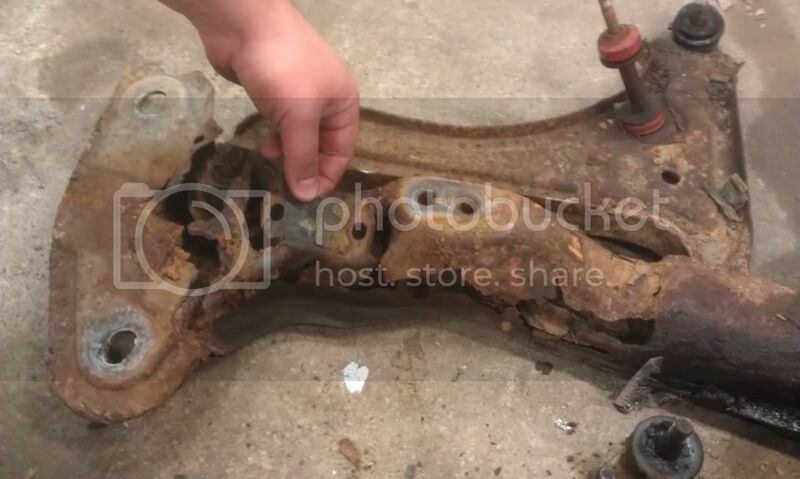 LOL rear main seal leak would have saved that frame. Well it did for my 90GT. The fear is setting in on the 95. Must agree on those freaking nice fillers! Always a fan of innards being tinted versus the exterior method. I've always had an oil leak issue with the pan, so my passenger subframe is still okay, but if I'm doing one I might as well do the other! I made sure when I did my inserts to not tint the back up lenses either, with my 20% window tint and the factory tint on the lenses it would've made them utterly useless, lol. That is a good way to think about it. You going to save the passenger frame as a spare? Yep, the driver's side I'll just throw in the scrap pile. Progress has been real slow though, I hate winter because I can't get any painting done! Sounds good, wish I had a spare subframe or two. As if adding to the pile is a good idea. Then again(lol). Hear ya on that! It can be done, leave the spray can inside until it's needed and use small heaters to warm the area before. Then there is the risk of it not holding and having to do it all over again. Best to wait and that is a weight on the mind.